Save big when you register by September 10! Emerging Planners, Planning Commissioners/Officials and Retired Planners receive a 20% discount off the Professional Planner registration fees. Discount applied during online registration. Discount does not apply to mobile workshops. NEW THIS YEAR: On Monday, October 15, there will be a Healthy Communities education track. Health Advocates and Professionals receive 20% discount on Professional Planner registration fees.The discount will be applied during online registration. Discount does not apply to mobile workshops. Late and Onsite registrations: An additional $50.00 administrative fee applies to all registrations received after October 1. All paid registrations will receive an email confirmation of registration (when a valid email address is provided). Registration fees include all applicable conference sessions and materials, and the meals listed herein. They do NOT cover lodging accommodations, any non-conference meals, and travel expenses. The registration fee is fully refundable if the PA Chapter of APA office receives written notification postmarked or emailed no later than September 24, 2018. Cancellations received after September 24, 2018 but before October 1, 2018, will be subject to a $50.00 administrative fee. If the cancellation is received after October 1, 2018 we are not able to provide a refund. NO-SHOWS WHO HAVE REGISTERED, BUT HAVE NOT PAID, ARE STILL LIABLE FOR THE REGISTRATION FEES. 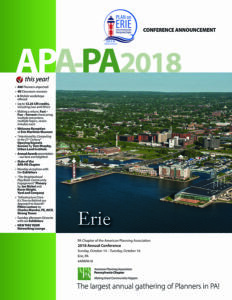 In the unlikely event of cancellation of the conference, the Pennsylvania Chapter of the APA’s liability is limited to 100% refund of registration fees and does NOT include penalty fees on travel tickets, deposits for hotel accommodations, or any other incurred expenses.